Dr Koen Desmet, best hip surgeon in the world! I had pain in my hip such that I couldn't throw my leg over the saddle to get on my bike. I had to lay it down and do a very careful baby step over it and then haul it up under me. Riding was all right but walking became a real pain and I started to walk fewer times with shorter distances. 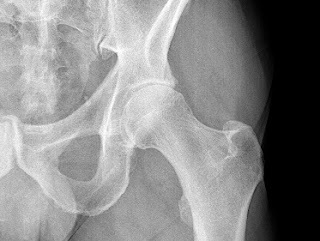 After 6 months on meds I got to see a Spanish orthopedic surgeon who confirmed I needed surgery and would have to go on a waiting list for a Total Hip Replacement (THR). I did some investigation and asked advice from old friends in the medical world and decided I really wanted a Resurfacing Procedure. Resurfacing is a more expensive and technically difficult operation but its unique selling point is that you can carry on with normal sporting activity. Apparently with a THR I could ride my bike OK but not run or lig about that much. I honed in on Dr Koen Desmet in Belgium who seemed to be the top man for the job and started plying him with questions. On Saturday 18 November I asked what sort of dates he had available, telling him I was ready now but expecting a date next January or so. He replied on Sunday and agreed January but said he had a spot next Wednesday! Excellent! No time to think (always the best way). Monday cranked up the computer and booked flights, train tickets and a one way car hire to the airport. Then to the bank and sent a vast wedge of €s to Dr Desmet's ANCA Medish Centrum. Tuesday Sally and I travelled to Gent, booked in to the hospital at 16:00 had all the pre-op stuff, X Rays etc. Wednesday morning operation (don't remember any of this) back to the ward and in the evening was invited by the nurse to take a little walk round the ward. Thursday more physio and Friday I was chucked out and sent over to the Holiday Inn to stay for the next week. At the Holiday Inn I'm being visited daily by Dr Desmet's physio for PT and nurse for medical supervision. I'm doing so well that I'm only using one crutch by Saturday and Sunday walking stairs normally - not one step at a time. This is my left hip - I'm going to change it for a nice new one. On Tuesday we had time to go into Gent and buy chocolate, drink chocolate, visit the Museum of Contemporary Art and eat some (lots) of Mussels. Friday - last day in Belgium and goodbye to everyone, including my physiotherapist Linda, who has been marching me up and down the Holiday Inn's corridors and stairs for the last week. 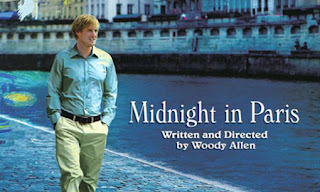 Woody Allen's Midnight in Paris. I wanted to like it, the photography was excellent, really made Paris look like you want Paris to look like. The story was sort of OK but I couldn't believe the characters (except maybe Salvador Dali). The leading actor was an Allen clone (but younger) which was a bit spooky. It could have been . . . . . but it wasn't. 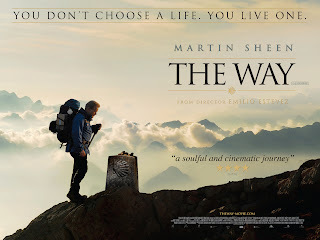 The Way was a nice surprise, also with excellent photography. It's the story of a father walking the Camino to Santiago de Compostela in memory of his son and the three friends he picks up on the way - that's it! But very believable. Nice.